The SofNeedle is designed to be twisted onto a luer-lock syringe to dispense and apply liquids and light gels. 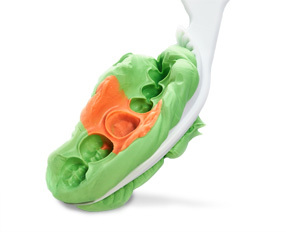 Scratch-resistant soft polyurethane foam tip allows easy dispensing and spreading of liquids/gels and even burnishing materials onto the tooth. Superior control of flow on vertical surfaces due to the slight back pressure feature of SofNeedles. Luer-lock design ensures that tips securely attach to syringes. * Not trademarks of Centrix, Inc.
Can I use the SofNeedle in any of my C-R Syringes?